In 2010, the Hugo Boss Prize was awarded to the German artist, Hans-Peter Feldmann (1941, Düsseldorf) to reward him for his career in contemporary art. The prize comprised of the sum of 100,00 dollars and the possibility to exhibit at the Solomon R. Guggenheim Museum. 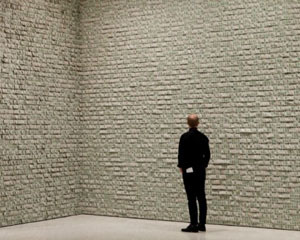 Deciding to use the total sum of the donation, the artist chose to use one hundred thousand dollar bills to decorate nine walls of the museum, spanning 45 metres long and 5 metres high. An installation which required two weeks to be set up. In the idea of Andy Warhol's 200 One Dollar Bills, according to whom "making money is art", Hans-Peter Feldmann wished to explain that when he started in the art world, in the 50s, money didn't have such a presence. For him, earning $100,000 is enormous and he therefore wishes to show his audience the mass that it represents.